Born of a passion for exploration, our bespoke expeditions offer the ultimate diving trip. Join us in March 2018 for our exciting new adventure: The Burma Banks! Following the success of our 2017 Manta Discovery expedition to Myanmar, we are heading back to the remotest areas of the Mergui Archipelago. We will return to the best dive sites we discovered in the northern areas of the archipelago and then take our expedition Off the Chart once more. This time we are heading way out West, to the famed Burma Banks, adding an extra 400km onto last years already epic odyssey. 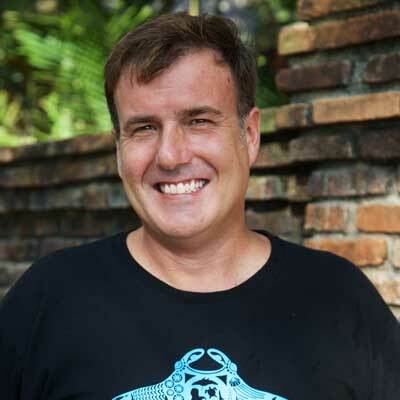 The Expedition hosts will be Diversion’s own Ric Parker and Anna Flam, a leading Manta Ray scientists from the Marine Megafauna Foundation and Global Manager of Manta Matcher Database. Join them for an exclusive Myanmar liveaboard combining a spirit of adventure, exploration and conservation, with the excitement of diving far flung locations. Like all our previous expeditions to Myanmar we will concentrating our diving around the Andaman Sea’s best Manta Ray aggregation sites and conducting our on-going, regional Manta Ray research. We are set to return to West Canister Island, a site we discovered that holds great potential to be another Manta hotspot. Starting from the world famous dive site Black Rock, the expedition will then head north beyond the range of standard Burma liveaboard trips, stopping at Great Western Torres and Tower Rock, before the long haul north to West Canister. On the return leg we will head Way Out West to explore the legendary Burma Banks. The northern reaches of the Mergui Archipelago are dotted with beautiful islands that abound in abundant topside nature, undisturbed by tourism. Each day holds mystery and excitement as we take Manta Ray science to new and exciting locations. Sicklefin Devil Rays (Mobula tarapanaca) at Tower Rock © Alex Tyrrell. Tower Rock features on day 3 of our expedition itinerary. It is recommended that guests arrive the day before the trip and stay the night in Khao Lak. There will be a non-mandatory but encouraged group dinner on 10th March to introduce your hosts and also the perfect opportunity for guests to get to know each other before we embark. Guests will be transported by private mini-bus to Ranong (border town) from Khao Lak or Phuket. We will board the MV Deep Andaman Queen for lunch. After clearing Thai and Burmese immigration we will motor into Myanmar waters heading north through the night. Day One is a non diving day but guests will be able to set up their diving gear, prep camera equipment and begin diving courses (if applicable). There will be a boat briefing in the afternoon and expedition introductions from your hosts. Day three is a four dive day at the famous Black Rock, rated by Dr Andrea Marshall as one of her top ten manta ray dive sites in the world. Day three is a four dive day heading north from Great Western Torres to Tower Rock visiting the best sites from 2017 plus new exploratory dives. Day four is a four dive day reaching our mostly northerly point at a site with great potential for Manta Rays and schooling Mobula Rays. Day six is a four dive day, the exact location will depend on weather and sea conditions and the potential for Manta Ray sightings. Day six is a four dive day at the famed Burma Banks. We plan to dive at least three different Banks, possibly four depending on conditions. Day seven is a two dive day, both dives at Western Rocky before we motor back to Kaw Thuang to exit Myanmar and re-enter Thailand. Day eight is a four dive day split between two of Thailand’s best Manta Ray dive sites. Last day of the expedition will be two dives at Thailand’s premiere Manta Ray aggregation site. Then head back to Tap Lamu for disembarkation and transfers to Khao Lak or Phuket. On previous expeditions over the years we have held an informal dinner at one of Khao Lak’s popular eateries on the night we return to land, this is non-mandatory and not included in the expedition. Possible Khao Lak Manta Ray Presentation by MMF researcher. Re-routeing is possible if safe sea and/or dive conditions are not met. This is the decision of the Captain and Expedition Leader. Re-routeing is not considered a cancellation and is non-refundable. An activity packed itinerary for this type of research expedition needs a substantial and reliable liveaboard vessel. The MV Deep Andaman Queen will once again be the chosen boat from which to explore the northern Mergui Archipelago and the Burma Banks before bringing us safely back to Thailand. This is the third year that a Manta Research Expedition has been conducted from the Deep Andaman Queen. It is a large mid-range boat, perfect for extended trips out at sea. It is one of the largest liveaboard boats venturing into these areas, and at 28m long and 7m wide, she has plenty of room for the 21 guests and staff. This twin engine steel hulled vessel accommodates guests comfortably in a variety of different cabins. The diving facilities are superb; boasting one of the largest dive decks in South-East Asia. The dive deck has separate entry and exit points, camera and equipment rinsing facilities and two fresh water showers. View full details of the Deep Andaman Queen. The master cabin spans the entire width of the bow on the main deck. It features panoramic windows, a large double bed, fridge & T.V. There are 3 deluxe double cabins. All are located on the main deck and feature windows with ocean views and spacious en-suite bathrooms. There are 2 deluxe twin cabins. Both are located on the main deck and feature windows with ocean views and spacious en-suite bathrooms. This cabin is ideal for a buddy pair looking for a decent berth on a decent boat, at a decent price. Located on the lower deck with easy access to the main deck. The triple cabin is on the lower deck towards the bow of the boat. The triple cabin oﬀers great value for money for a mid-range Similan liveaboard. The quad cabin is in the bow of the lower deck. It sleeps 4 guests on 2 twin bunks. Like all cabins there is air-conditioning and an en-suite bathroom. Our team work year round planning these exclusive expeditions. We combine the best aspects of liveaboard diving at remote locations, with interesting scientific work and other special activities to create an exciting adventure. We are on hand to answer any questions you may have before making the commitment to join us. What are the chances of Manta Ray encounters? Is my diving experience enough to join the trip? What will be my role in the research? These are just some of the questions we often get asked. We will answer your inquiry as thoroughly and honestly as possible. This is our commitment to ensure that our expeditions are right for you. It is our guests that really mould each expedition into a long lasting and memorable experience. This is confirmed by the fact that on our most recent trips, over 50% of our guests have joined us on previous adventures. Contact us today to become part of our truly unique diving expeditions. 30% deposit is required within 2 weeks to confirm your booking. Balance is due 90 days prior to departure. Cancellation Policy: 90 days+ prior to trip departure date. All payment will be refunded, less 10% of total cost. Domestic ticket is non-refundable. 90-45 days prior to trip departure date. All payment will be refunded, less 40% of total cost. Domestic ticket is non-refundable. Less than 45 days prior to trip departure date. No refund will be made. Domestic ticket is non-refundable. Biology presentations, Photo Identification tutorial & more. Presentations, shooting tips and photo critique sessions. Equipment 700฿ per day. Diving insurance required. 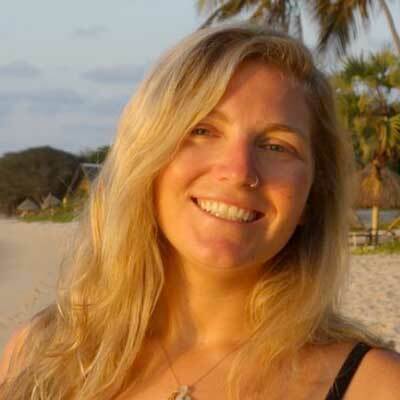 Anna Flam is a field researcher for the Marine Megafauna Foundation, currently based in Tofo, Mozambique. Anna is the global manager for ‘Manta Matcher’- the Wildbook for manta rays. Having lived and worked in Thailand for 4 years she is not only incredibly fond of the region but has a wealth of experience as well. Ric is one of MMF’s most dedicated volunteers in South-East Asia working to help educate communities about the plight of manta rays in the region and helping to lead expeditions to observe these gentle giants in the wild. He also leads efforts to promote and collect data for MantaMatcher in Thailand and Myanmar. Alex Tyrrell is a professional underwater photographer based in Thailand. 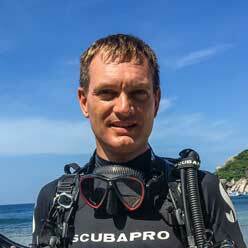 Originally from the UK, he now operates Dive4Photos, a dedicated underwater photography training facility on Koh Tao. He is a freelance photojournalist for numerous dive magazines and nature based publications and is a regular speaker at dive shows. Rachel is a dive professional and underwater photography enthusiast who has been working in the industry for the last 8 years. 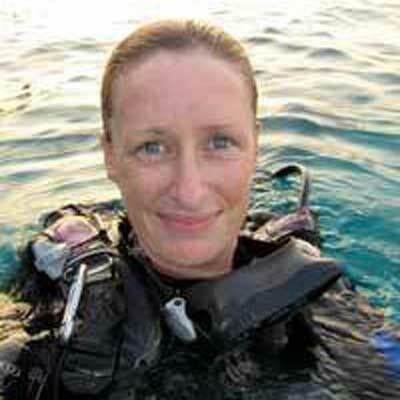 Passionate dive traveller and marine life guru who believes sharing her knowledge and love for the underwater world with others is the key to protection of our precious marine species.